Floor plans are essential in selling and letting property, providing an invaluable way for buyers to assess if a property meets their needs. 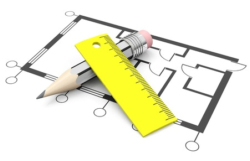 When you use EPC4U for your floor and lease plan requirements you can count on speed and quality. Once we've measured up for your floor plan you're our number one priority, we don't stop until it's complete. If you need a quick turnaround you can't do better! Laws introduced in 2003 mean that any new lease lasting seven years or longer must be registered with the Land Registry and have a compliant lease plan. The lease plan is basically a drawing that identifies what area of land is included in the lease. Include any land associated with the property, such as the garage, garden. Clearly indicate the separate parts of the property, such as the house, parking, dustbin space, etc.